During a retreat it is usual to alternate periods of sitting meditation with periods of formal walking meditation of about the same duration, one after another throughout the day. One hour is a standard period, but forty-five minutes can also be used. For formal walking, retreatants choose a lane of about twenty steps in length and walk slowly back and forth along it. 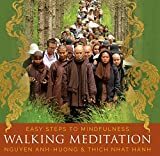 Walking meditation develops balance and accuracy of awareness as well as durability of concentration. One can observe very profound aspects of the Dhamma while walking, and even get enlightened! In fact, a yogi who does not do walking meditation before sitting is like a car with a rundown battery. He or she will have a difficult time starting the engine of mindfulness when sitting. Walking meditation consists of paying attention to the walking process. If you are moving fairly rapidly, make a mental note of the movement of the legs, "Left, right, left, right" and use your awareness to follow the actual sensations throughout the leg area. If you are moving more slowly, note the lifting, moving, and placing of each foot. In each case you must try to keep your mind on just the sensations of walking. Notice what processes occur when you stop at the end of the lane, when you stand still, when you turn and begin walking again. Do not watch your feet unless this becomes necessary due to some obstacle on the ground; it is unhelpful to hold the image of a foot in your mind while you are trying to be aware of sensations. You want to focus on the sensations themselves, and these are not visual. For many people it is a fascinating discovery when they are able to have a pure, bare perception of physical objects such as lightness, tingling, cold, and warmth. Our effort to be aware of lifting the foot must neither overshoot the sensation nor weakly fall short of this target. Precise and accurate mental aim helps balance our effort. When our effort is balanced and our aim is precise, mindfulness will firmly establish itself on the object of awareness. It is only in the presence of these three factors -- effort, accuracy, and mindfulness -- that concentration develops. Concentration, of course, is collectedness of mind, one-pointedness. Its characteristic is to keep consciousness from becoming diffuse or dispersed. As we get closer and closer to this lifting process, we will see that it is like a line of ants crawling across the road. From afar the line may appear to be static, but from closer up it begins to shimmer and vibrate. And from even closer the line breaks up into individual ants, and we see that our notion of a line was just an illusion. We now accurately perceive the line of ants as one ant after another ant, after another ant. Exactly like this, when we look accurately at the lifting process from beginning to end, the mental factor or quality of consciousness called "insight" comes nearer to the object of observation. The nearer insight comes, the clearer the true nature of the lifting process can be seen. It is an amazing fact about the human mind that when insight arises and deepens through vipassana (or insight) meditation practice, particular aspects of the truth about existence tend to be revealed in a definite order. This order is known as the progress of insight. The first insight that meditators commonly experience is to begin to comprehend -- not intellectually or by reasoning, but quite intuitively -- that the lifting process is composed of distinct mental and material phenomena occurring together, as a pair. The physical sensations, which are material, are linked with, but different from, the awareness, which is mental. We begin to see a whole succession of mental events and physical sensations, and to appreciate the conditionality that relates mind and matter. We see with the greatest freshness and immediacy that mind causes matter -- as when our intention to lift the foot initiates the physical sensations of movement, and we see that matter causes mind -- as when a physical sensation of strong heat generates a wish to move our walking meditation into a shady spot. The insight into cause and effect can take a great variety of forms; but when it arises, our life seems far more simple to us than ever before. Our life is no more than a chain of mental and physical causes and effects. This is the second insight in the classical progress of insight. As we develop concentration we see even more deeply that these phenomena of the lifting process are impermanent, impersonal, appearing, and disappearing one by one at fantastic speed. This is the next level of insight, the next aspect of existence that concentrated awareness becomes capable of seeing directly. When one is very mindful during a single lifting process -- that is to say, when the mind is with the movement, penetrating with mindfulness into the true nature of what is happening -- at that moment, the path to liberation taught by the Buddha opens up. The Buddha's Noble Eightfold Path, often known as the Middle Way or Middle Path, consists of the eight factors of right view or understanding, right thought or aim, right speech, right action, right livelihood, right effort, right mindfulness, and right concentration. During any moment of strong mindfulness, five of the eight path factors come alive in consciousness. There is right effort; there is mindfulness; there is one-pointedness or concentration; there is right aim; and as we begin to have insight into the true nature of the phenomena, right view also arises. And during a moment when these five factors of the Eightfold Path are present, consciousness is completely free from any sort of defilement. As we make use of that purified consciousness to penetrate into the true nature of what is happening, we become free of the delusion or illusion of self, we see only bare phenomena coming and going. When insight gives us intuitive comprehension of the mechanism of cause and effect, how mind and matter are related to one another, we free ourselves of misconceptions about the nature of phenomena. Seeing that each object lasts only for a moment, we free ourselves of the illusion of permanence, the illusion of continuity. As we understand impermanence and its underlying unsatisfactoriness, we are freed from the illusion that our mind and body are not suffering. This direct seeing of impersonality brings freedom from pride and conceit, as well as freedom from the wrong view that we have an abiding self. When we carefully observe the lifting process, we see mind and body as unsatisfactory and so are freed from craving. These three states of mind -- conceit, wrong view, and craving -- are called "the perpetuating dhammas." They help to perpetuate existence in samsdra, the cycle of craving and suffering that is caused by ignorance of ultimate truth. Careful attention in walking meditation shatters the perpetuating dhammas, bringing us closer to freedom. You can see that noting the lifting of one's foot has incredible possibilities! These are no less present in moving the foot forward and in placing it on the ground. Naturally, the depth and detail of awareness described in these walking instructions should also be applied to noting the abdominal movement in sitting, and all other physical movements. The Buddha described five specific benefits of walking meditation. The first is that one who does walking meditation will have the stamina to go on long journeys. This was important in the Buddha's time, when bhikkhus and bhikkhunis, monks and nuns, had no form of transportation other than their feet and legs. You who are meditating today can consider yourselves to be bhikkhus, and can think of this benefit simply as physical strengthening. The second benefit is that walking meditation brings stamina for the practice of meditation itself. During walking meditation a double effort is needed. In addition to the ordinary, mechanical effort needed to lift the foot, there is also the mental effort to be aware of the movement -- and this is the factor of right effort from the Noble Eightfold Path. If this double effort continues through the movements of lifting, pushing and placing, it strengthens the capacity for that strong, consistent mental effort all yogis know is crucial to vipassana practice. Thirdly, according to the Buddha, a balance between sitting and walking contributes to good health, which in turn speeds progress in practice. Obviously it is difficult to meditate when we are sick. Too much sitting can cause many physical ailments. But the shift of posture and the movements of walking revive the muscles and stimulate circulation, helping prevent illness. The fourth benefit is that walking meditation assists digestion. Improper digestion produces a lot of discomfort and is thus a hindrance to practice. Walking keeps the bowels clear, minimizing sloth and torpor. After a meal, and before sitting, one should do a good walking meditation to forestall drowsiness. Walking as soon as one gets up in the morning is also a good way to establish mindfulness and to avoid a nodding head in the first sitting of the day. I hope that all of you will be successful in completely carrying out this practice. May you be pure in your precepts, cultivating them in speech and action, thus creating the conditions for developing samadhi and wisdom. May you follow these meditation instructions carefully, noting each moment's experience with deep, accurate and precise mindfulness, so that you will penetrate into the true nature of reality. May you see how mind and matter constitute all experiences, how these two are interrelated by cause and effect, how all experiences are characterized by impermanence, unsatisfactoriness and absence of self so that you may eventually realize nibbana -- the unconditioned state that uproots mental defilements -- here and now. Sayadaw U Pandita was the abbot of Panditarama Monastery and Meditation Center in Rangoon, Burma. One of the renowned teachers in the tradition of Mahasi Sayadaw, he taught from his own profound meditation experience, his 62 years of monastic training, and his extensive studies of the Pali texts. He taught meditation worldwide since 1951. For more info., visit http://www.saddhamma.org/Teachers.html.